I love fitness and running but keeping myself accountable is tough. I don’t run with a team and I go to most of my classes solo. Fortunately, through trial and error, I’ve built a self-sufficient accountability system that works for me so it’s no longer a struggle to stay fit and run often. In fact, my struggle is scaling back so I don’t further injure myself. Let me share ten ways I keep myself an accountable runner. 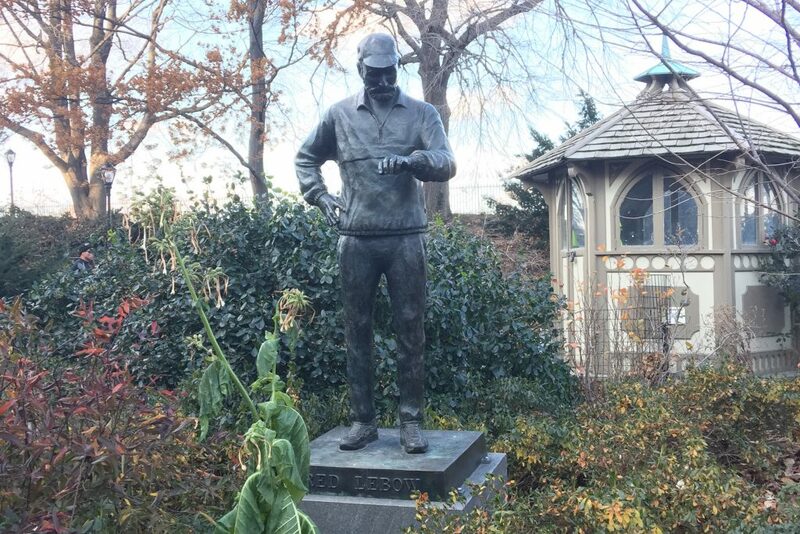 Fred Lebow, founder of the NYC Marathon, checking up on all the runners in Central Park. There is magic in talking to others about my marathon training and fitness goals. It solidifies the act and keeps me in check about getting my workouts done. If I share my goals and don’t put in the work to accomplish them, I’d look like a fool so talking about it helps me avoid that. I often reach out to my experienced running friends for training advice and getting their feedback is always inspiring. I’ve always used writing to help me reflect on what’s going on in my mind. When I started the 9+1 journey to qualify for the TCS New York City Marathon, I decided to write about the process so I could track my progress in a tangible manner. Writing about running has been instrumental in keeping me accountable, especially when friends tell me how my blog posts inspired them to get back into it too. This year, I’ve already completed fifteen races and I’m not stopping there. As I’ve learned, racing too much could lead to painful injuries but racing often helps me stick with my training. I like using races as stepping stone goals so I don’t fall behind. Racing is also a good way to evaluate my fitness down to a number that makes sense to me. When I have my best mile race pace, I challenge myself to beat it. Intrinsic gains are not enough – everything I do needs to be shared on social media. Strava, to be exact (add me!). Most of my friends there are much faster so I often feel left behind but I love using that as fuel and inspiration to keep going. I love having my workouts logged in because I need occasional reminders that I have been working hard. It’s especially gratifying when my harshest Strava critics gives me “kudos” on my activities. I love Twitter and following athletes I admire, publications that know their stuff and organizations and companies that are active in the running community. Articles and nuggets of wisdom that are shared are so valuable for me because they provide useful tips. Learning about running keeps me excited about the sport and eager to implement new tactics to help me improve. I plan my workouts far in advance because it keeps me on a rigid schedule. I actually have nearly everything planned out until November 5th. By blocking off calendar time, I’m committing to it. Of course, my routine changes based on life and how my body feels so I need to be flexible but having that blockage visible on my calendar makes me more motivated to get out and complete my workouts. Initially, my goal was to qualify for and run the NYC marathon. I haven’t even completed my first marathon yet but now, my goal is bigger. I want to qualify for and and run the Boston Marathon in the next few years and eventually earn my six star finisher. I also want to schedule trips around the world in relation to races happening. Lastly, my life goal is to be one of those marathoner grandmas. I love running but that can get boring and it’s actually not great for training. Since I need to activate muscles that aren’t efficiently built through running, I do a lot of cross training. Training became exciting and fun again when I brought in HIIT, kickboxing, spin classes, yoga and more. I also like trying new things so always going to a new studio gets me excited about the workout and people I could potentially meet. Not all my friends like to run but they love fitness. I take advantage of that and go to different classes with them. Being at classes with friends is a great way to hang out, have fun and help each other maintain fitness goals. As much as I love trying new things, it could be daunting but having people I know around makes it easier. Also, it’s harder to back out of classes when I know my friends are doing it too. My marathon training goes back to a solid purpose. I have a million reasons why I run but the most important is showing appreciation to a body that can do anything. I suffered some medical complications when I was born and was never the fit kid on the block – no one believed I could physically run as much as I do now, yet I’m doing it! I have one life to do my body justice and running is how I manifest my strength. It takes hard work and testing various approaches to get an accountability system right but it’s worth it. This is what works for me and may not work for you but hopefully, there are some insightful takeaways. And in the rare occasions when my system fails, I approach training like this: if I think it’s hard to get a workout done, I imagine what it’s like to quit. Let me tell you, I’d rather come in dead last and bleed like hell than quit.